Which makes it easy to see why, on our nation’s 50th anniversary, the colourful passage was selected as one of the 50-plus published works to be featured in Wild Rice’s upcoming play, Another Country. Lifted from a letter written by English explorer Isabella Bird to her sister during the former’s visit to Singapore, the description of the island is at odds with the version preferred by those who believe in the ‘fishing village to first world’ narrative ascribed to a certain, late political leader. Provocation – along with a good dose of humour – is the crux of the production. 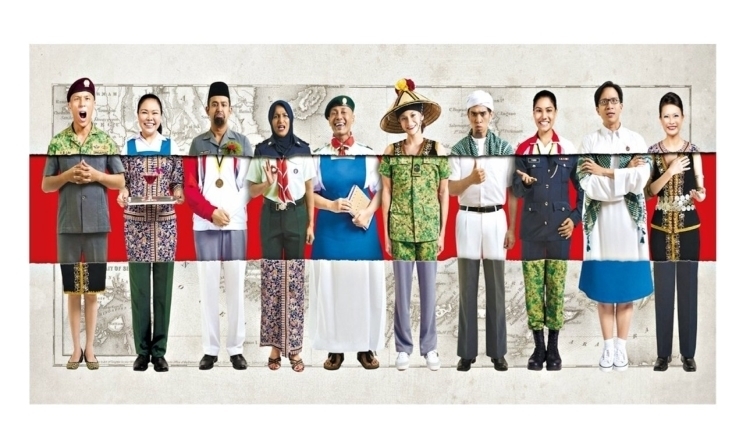 Another Country is, chiefly, a story of two neighbours: Singapore and Malaysia. It explores the relationship between ‘us and them’ – and humanity as a whole – using short stories, plays, interviews and jingoistic songs to bridge the pair. The first half of the performance features texts culled from Singapore’s cultural archive while the second half plumbs from Malaysian works. And the twist: each half is performed by actors from the opposite country. The chosen texts date back to the 15th century. Alfian Sa’at, who curates the Singaporean works, explains that while he was led by his ‘idiosyncratic taste in both the literature produced about Singapore and by Singaporeans’, he opted for a ‘broad historical sweep’. Texts from the Malay annals, writings from colonial travellers, Singaporeans writing in exile, songs about the Little Red Dot and even the work of Catherine Lim and Michael Chiang make appearances. ‘I was very conscious that I wasn’t performing a canonising function,’ Alfian adds. And not a rabble-rousing function, either. Malaysian playwright Leow Puay Tin – he’s Alfian’s northern equivalent inAnother Country – insists his chosen texts serve not to mend fences but break them altogether. Gwen Pew checks out what’s on offer at Singapore’s two main water parks – plus a third opening soon nearby. Adventure Cove Waterpark. Image courtesy of Resorts World Sentosa. The newest waterpark on the island, Adventure Cove opened in Resorts World Sentosa at the end of 2012. It is home to six slides – including the notorious Riptide Rocket, the first hydro-magnetic water-coaster in South-East Asia – as well as a whole bunch of attractions that cater to visitors of all ages and gut levels. Tots can enjoy the shallow wading pools and fountains at Seahorse Hideaway, while daredevils can take on the challenge of Splashworks, where you can cross tight ropes and jump off ‘cliffs’. For a more immersive experience, float down one of the world’s longest lazy rivers and experience 14 different habitats, snorkel with 20,000 fish in Rainbow Reef or get up close and personal with dozens of rays at Ray Bay (an extra charge of $38 applies). Do note, however, that crowds and queues do tend to get quite crazy during weekends and school holidays, so either go early, or take a day off (trust us, it’s worth it!). 8 Sentosa Gateway, RWS (6577 8888, http://www.rwsentosa.com). MRT: HarbourFront, then Sentosa Express. Daily10am-6pm. $20-$33. Adventure Cove may have taken over as the largest waterpark in Singapore, but Wild Wild Wet is a bit cheaper and still tons of fun. While smaller children can take it easy in the meandering Shiok River or splash around in Yippie!, a shallow sloshing area, older kids can enjoy slides, ladders, water cannons and fountains at Professor’s Playground. For brave adventure-seekers, grab a few friends and head to Ular Lah – the first raft slide in South-East Asia complete with high, banked corners and 360-degree spins – or take it to the next level of thrill at the recently-opened Torpedo, where you will free fall from a height of 18 metres (the equivalent of seven storeys) at the mind-blowing speed of 70km/h. If the stress gets a bit too much, there’s always the Jacuzzi for you to relax at – just sit back and let jets and bubbles untangle your kinks and knots. With nine rides in total, there’s plenty to enjoy for the whole family. Downtown East, 1 Pasir Ris Cl (6581 9128). MRT: Pasir Ris. Mon-Fri 1-7pm, except Tue; weekends and public holidays 10am-7pm. $14-$19; free for toddlers under three. Feel like you’ve exhausted your options here in Singapore? You’re in luck – a brand new waterpark is currently being built just over the causeway. 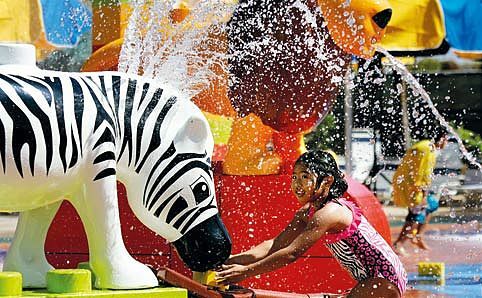 Legoland Malaysia’s Water Park – the largest in the world – is set to open its doors to the public on 21 October. While their main target audience is two- to 12-year-olds, we’re personally getting quite excited at the prospects of having the opportunity to experience 20 water slides and over 70 Lego models. One of the park’s highlight is the ‘Build a Raft’ River, where children can float down a lazy river in their self- built soft Lego brick raft. Limited numbers of Premium Annual Passes will go on sale from this month for MYR395 ($158), which will be valid for both the Water Park and the Theme Park next door (whose opening date is yet to be confirmed). 7 Jln Legoland, Bandar Medini, Nusajaya Malaysia, Nusajaya, Johor, Malaysia (+60 7 597 8888, http://www.legoland.com.my). Sun-Tue & Thu-Fri 10am-6pm; Sat 10am-8pm.